Dale Sparrow unloads fish from the Isabella-Ava on Jan. 18, 2015, at the Portland Fish Exchange in Portland. 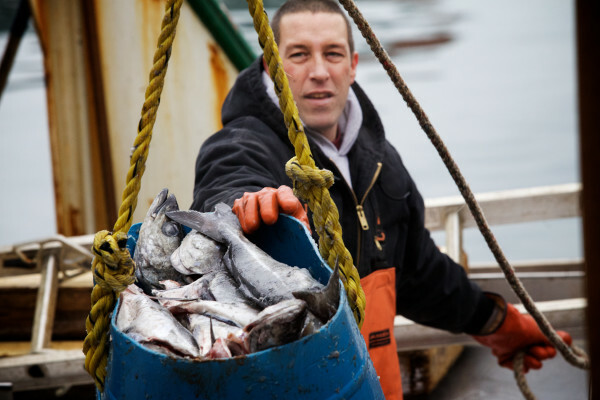 PORTLAND, Maine — A group representing various parts of Maine’s seafood industry on Thursday will set to crafting a plan to build its future workforce, a problem it and other trades in the state see ahead. Coombs said the focus on workforce development came from speaking with the group’s members about common challenges, with training posing a challenge for employers like seafood processors and fishermen alike. Coombs said the group includes 36 groundfish fishermen and training opportunities could help them branch out into other work in the offseason and help others weather environmental or regulatory changes, such as the closure of the shrimp fishery in the Gulf of Maine. That could include training to adapt certain skills to other similar industries, Coombs said, such as agriculture and forest products. The group was scheduled to meet Thursday in Freeport to assess some of those needs, which it would put together in an application for an initial cluster planning grant of up to $50,000 from the Maine Technology Institute. Coombs, who also directs the seafood program at the Maine Coast Fishermen’s Association, said gathering information Thursday is the first step toward having a group like Coastal Counties Workforce put together training curriculum to suit the industry’s needs.